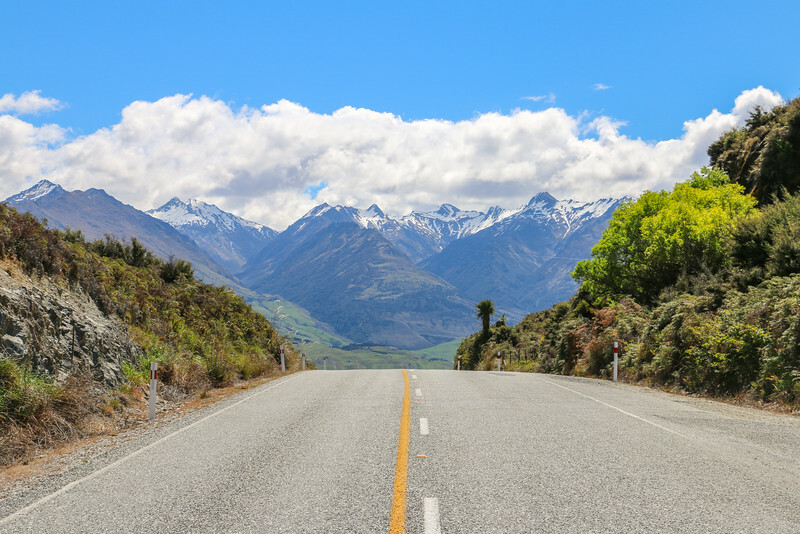 It’s no secret that New Zealand is a stunning place to visit and one of our favourite destinations for a road trip. Ever! During the 3 weeks we spent in the South Island, we found ourselves in a remote part of the West Coast looking to drive from Glacier Country to Queenstown. This was after two days exploring New Zealand’s famous glaciers. The route from Glacier Country to Queenstown is fairly long at 350 km, but also very beautiful with stunning and diverse scenery throughout. 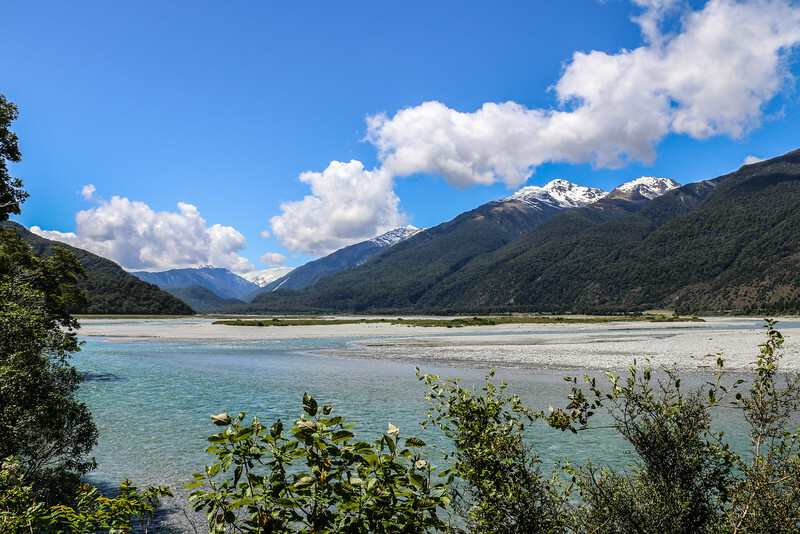 It goes through Haast pass, a mountain pass in the Southern Alps. You’ll find miles of beaches, towering mountains, rivers and waterfalls, plus picture-perfect lakes. Plenty of reasons worth stopping for and a long drive turns into a pleasant day exploring New Zealand’s great outdoors. 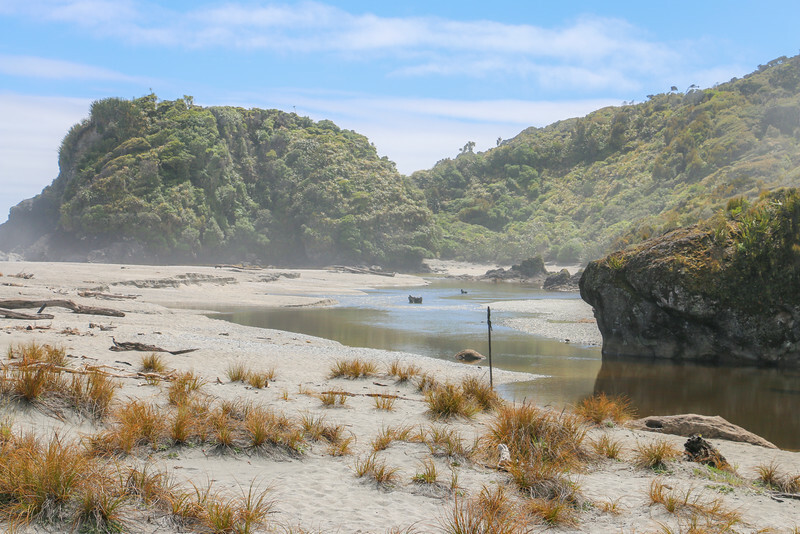 This route covers parts of Te Wāhipounamu, a World Heritage Site. While on the West Coast, there are miles of beaches worth a quick stop. After leaving Glacier Country, the road heads briefly towards the coastline of the Tasman Sea at Bruce Bay, a beach where you can see the rainforest meeting the sea. Great for a walk on this wild beach! The next stop is Knights Point lookout. The views from the top of this cliff are some of the best along the coast. Towards South is Arnott Point, a resting area for seals. For birdwatching lovers, Ship Creek beach is where you’ll want to stop. It has a viewing tower and two small trails (around 30 minutes). One along the beach dunes and the other into a swamp forest. 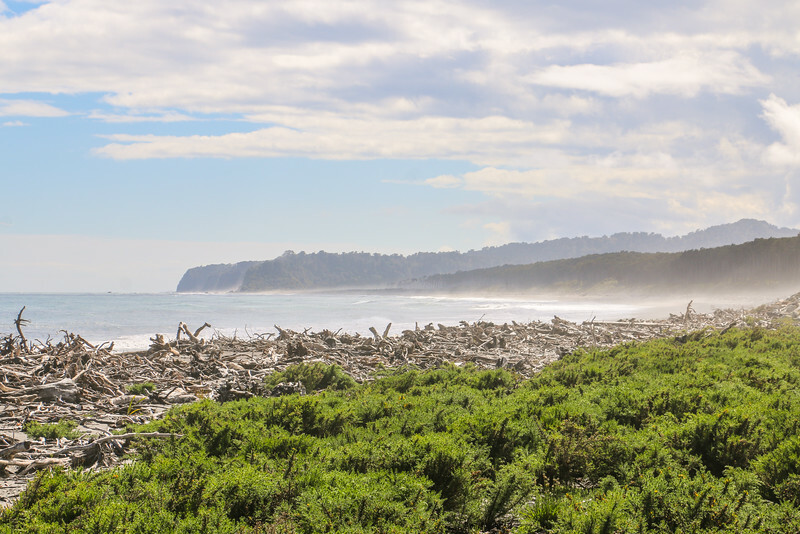 Instead of continuing straight on state highway 6, make a quick side-trip at Haast Junction to Haast Beach and you won’t regret it. Perfect for a break. If you keep following the road, you’ll reach Jackson Bay, a small fishing village where the West Coast road ends. The Haast Pass road starts properly at the small Haast Township. From there, it follows the Haast River up to the Haast Pass and then descends until it reaches Makarora, the closest town. This section of the route from Glacier Country to Queenstown is predominantly forest and beautiful mountain scenery. 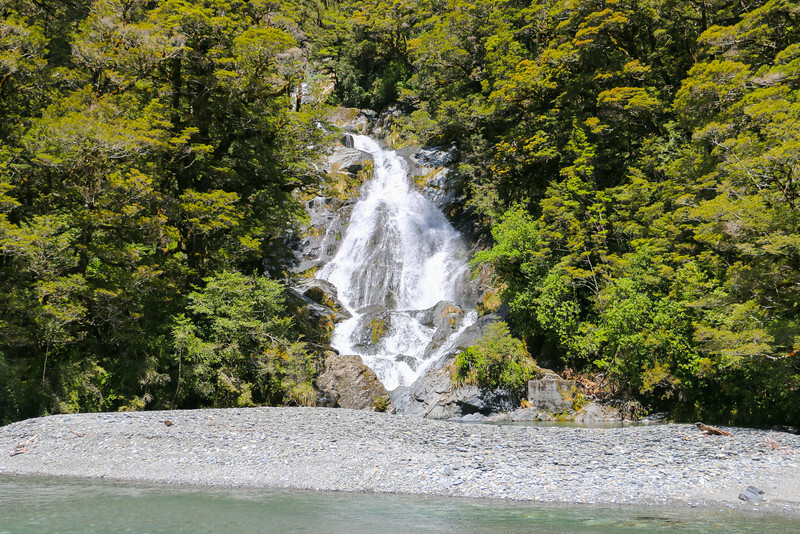 There are a few good reasons to stop along Haast Pass road. 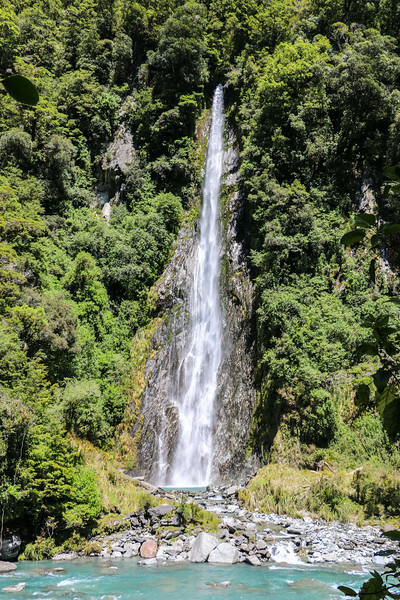 You shouldn’t miss two well-known waterfalls, Thunder Creek falls and Fantail falls. Both of easy access and a short walk away from the car parks. Thunder Creek falls is the most impressive one with a drop of 28 m! The next mandatory stop is at the Blue Pools. Also easy to get to from the car park, these pools require a short hike to reach them. The name is pretty obvious bearing in mind the amazing crystal clear blue colour of the pools. 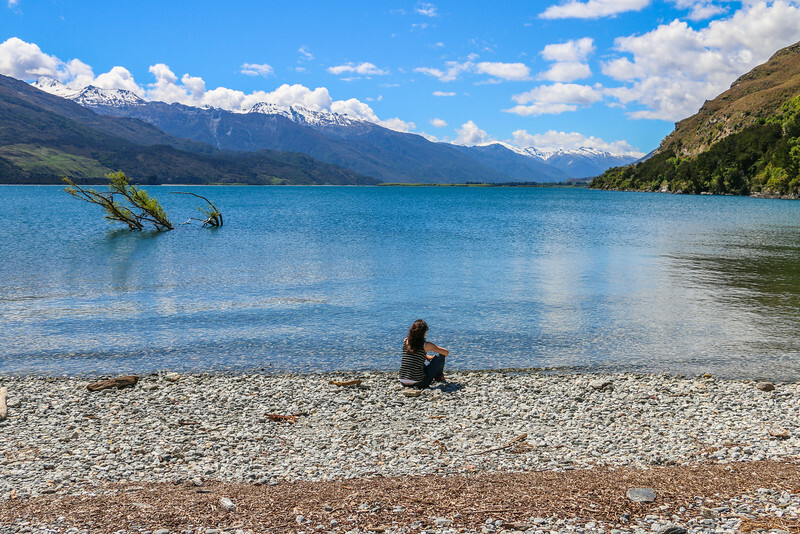 Not far from Makarora is the northern shore of Lake Wanaka, one of the most famous lakes in the region. The road follows the shoreline for a while and there are some parking areas where you can stop and admire the lake and the mountains – precisely what we did! Before reaching Wanaka, the road crosses to the other side of the mountain and follows Lake Hawea, another equally impressive lake. 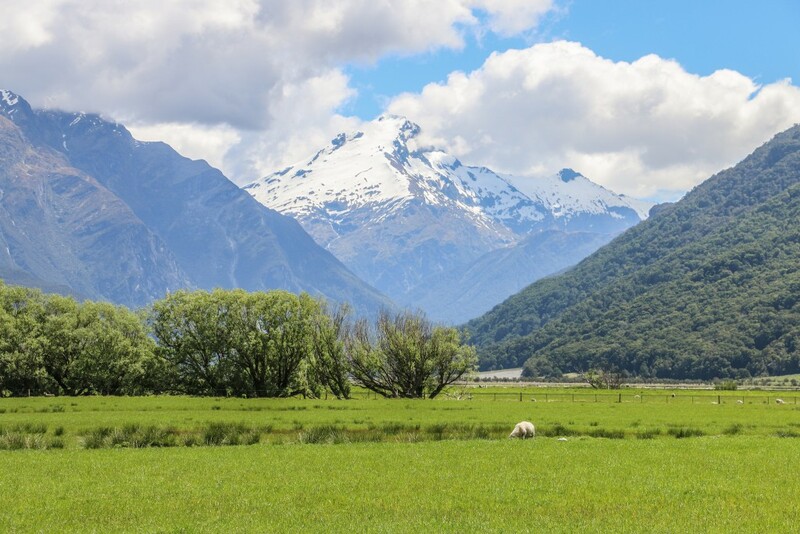 Don’t forget to admire the imposing Mount Aspiring National Park mountains. Finally in Wanaka! And what a pretty place. It’s just picture-perfect. We recommend spending some time on the lakefront, where you can catch some sunshine or maybe drink a pint of a locally brewed beer at one of the cafés. Looking back, we probably should have stayed in Wanaka, at least, a couple of days. With so much to explore in the vicinity, it really is a shame we didn’t do it. Well, now we have yet another reason to return to New Zealand! 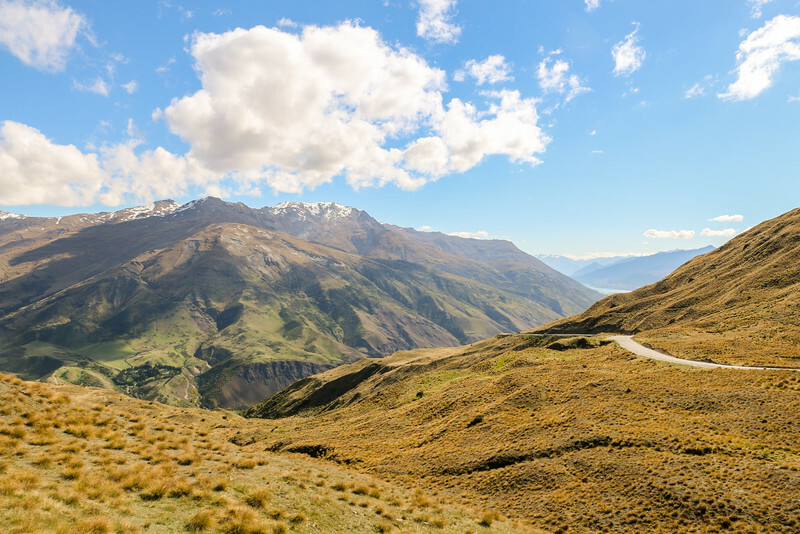 From Wanaka to Queenstown, there is a scenic route through the mountains called Crown Range road, which you should try. The views are well worth it. Plus, it’s also good fun driving mountain roads. The alternative is to get back on state highway 6. 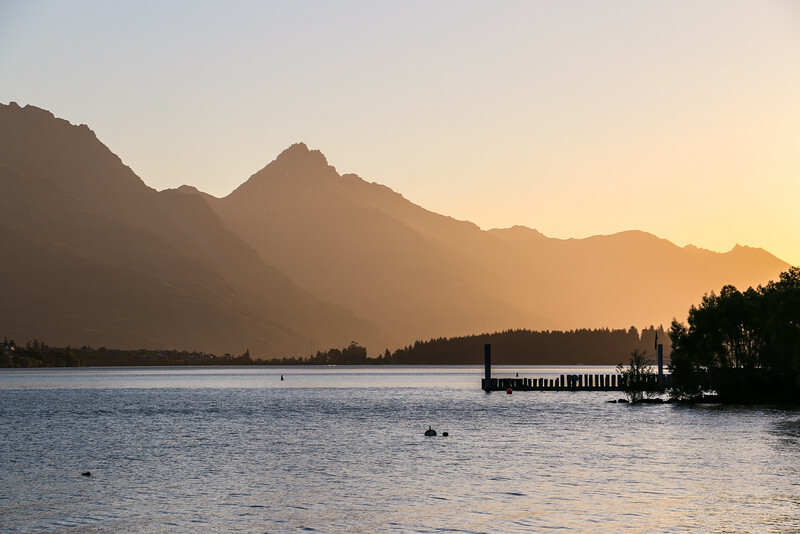 Queenstown lies on the shores of Lake Wakatipu and is one of the most popular places in New Zealand. With lots to do there, it’s really difficult to stay put. Whether skiing in Winter or bungee jumping in the Summer, you’ll definitely find something to test your adventure sports skills. 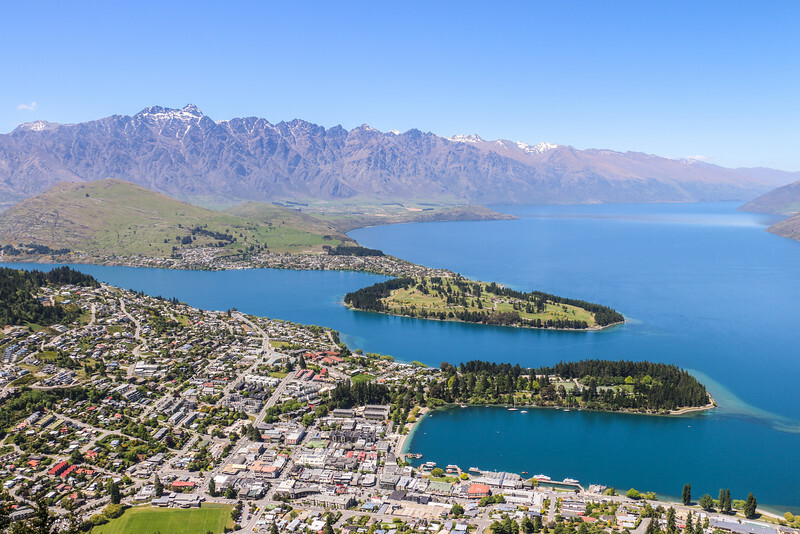 If you’re not into those things, the least you can do is go to Bob’s Peak for stunning views over Queenstown, Lake Wakatipu and the surrounding mountains. Queenstown is also a good place for day trips to Milford Sound. Have you been to New Zealand? Did you try the route from Glacier Country to Queenstown? I’m amazed by both tale and pictures. You were very lucky to find such a blue sky every day. what was the temperature? Thank you, Sabrina. The temperature was in the low 20s. I would love to visit Queenstown someday. I can see definitely why you must stop at The Blue Pools, the water looks so inviting and Lake Wanaka is also a must visit for me. Good stuff guys. Beautiful part of New Zealand. You must go! New Zealand is my husband’s dream destination. I can easily see why. And we are scheduled to go there next year! You’re going to love it there. Wow! Your photos are fabulous and so are those beaches. We have several neighbors in Boquete that are from New Zealand and I swear every picture they show me (just like yours) is better than the last. Just amazing. Thank you, Melody! 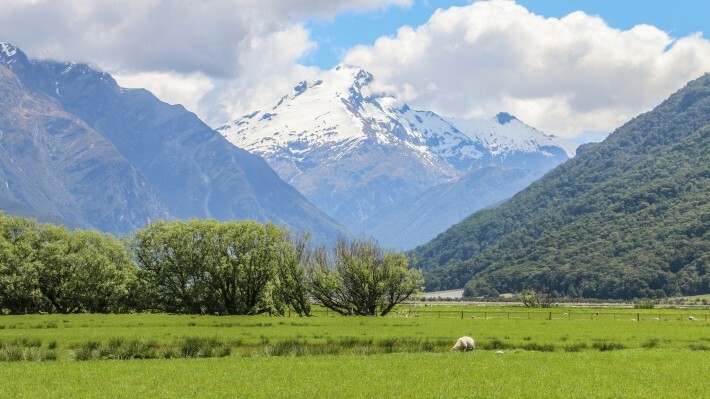 Yes, New Zealand has a lot of picture-perfect locations. Thanks for confirming that NZ is as beautiful as I had always imagined. Can’t wait to visit some day. New Zealand has been a bucketlist destination for me and everytime I read blog articles on it, it makes me want to go even more. You should definitely go! We felt like that before going. 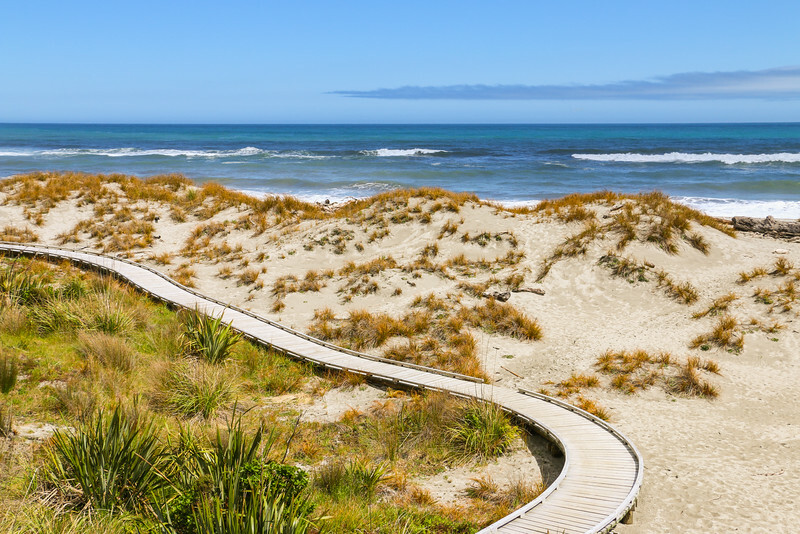 I knew I wanted to explore New Zealand – but now you’ve made me want to get there sooner rather than later! 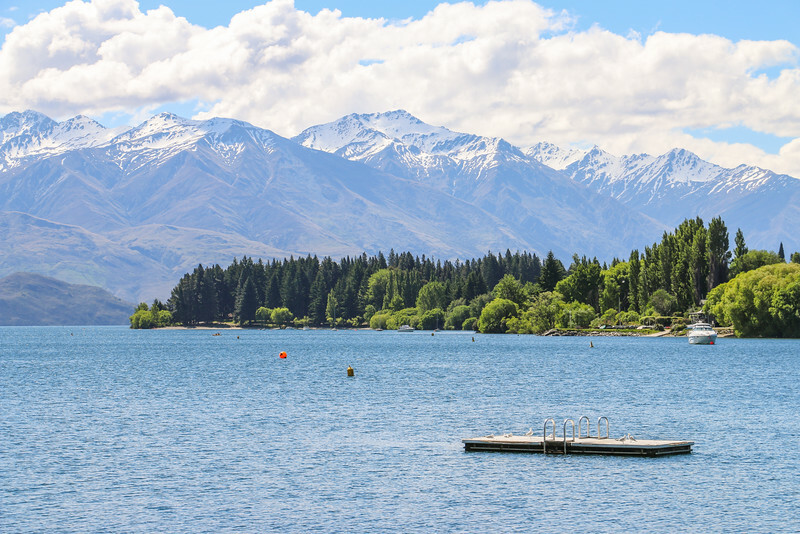 So much natural beauty and Lake Wanaka looks so peaceful! We’re happy to inspire fellow travellers to visit new places! New Zealand is one of the most beautiful places we’ve ever been to and you won’t be disappointed! This route looks absolutely stunning, I’d be stopping every 5 minutes to take pictures! What a beautiful journey! I feel as though I was right there with you through your incredible photos. New Zealand is a place I’ve been wanting to go for a while. Luckily, I’m a flight attendant and my company will start flying there in June and I can go for free! Thanks for the introduction to Queenstown. That’s a great opportunity to visit New Zealand. Being a flight attendant certainly has its perks! 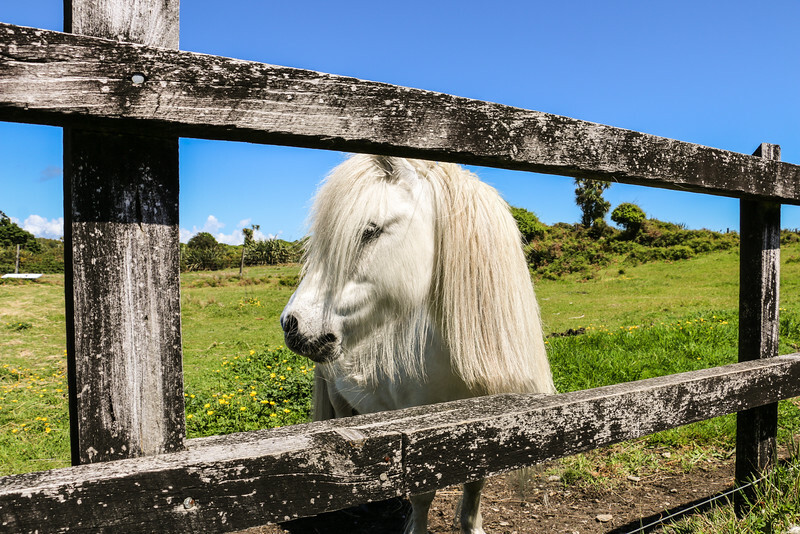 Make sure yo stay a bit of time so you can see some of the amazing things New Zealand has to offer. Man imagine how fortunate they are to have that much natural beauty surrounding their city proper. Imagine all the outdoor activities available and very much accessible from the city! I would really love to spend time in the southern hemisphere. Go around Australia and stay in New Zealand for a while. Glad you guys are having fun! More power to you guys, Hugo and Cristina! New Zealand is all about natural beauty! It’s a paradise for outdoor lovers. We certainly wouldn’t mind living there. And we definitely need to visit Australia as well! Amazing pictures! New Zealand is on my have to get back to ASAP places! I would live here if I could! Cheers Joe! Same here. Such a beautiful place. wow!! Love all the photographs. You made me dreaming about New Zealand. I, myself, had an incredible road trip between Queenstown and Fiordland! In fact, I wrote a similar article about many of the lesser-known stops along the way. 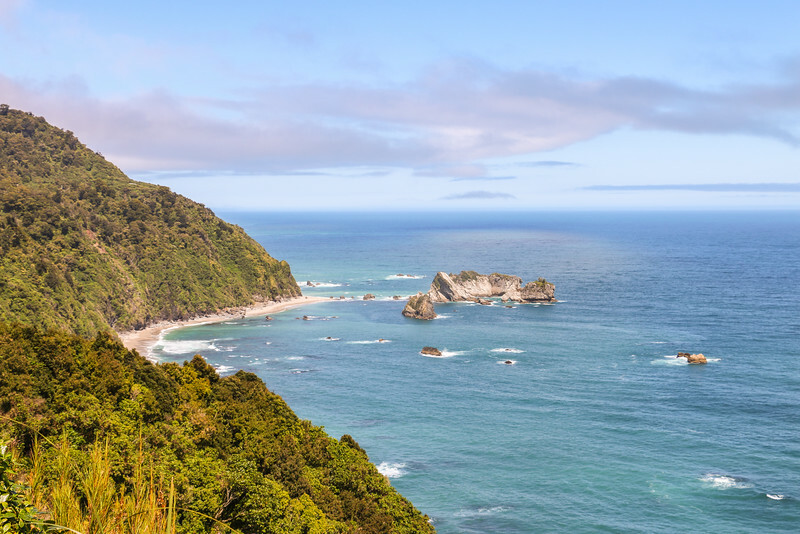 It seems as though the South Island is almost entirely covered with beautiful sights, amazing attractions and interesting destinations. Absolutely love this post! great content and beautiful pictures! Going to take a look! This was a very scenic drive and the weather was gorgeous, which really helped.